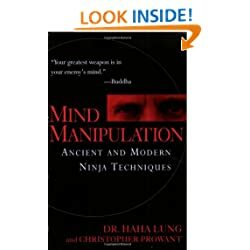 Mind Manipulation: Ancient and Modern Ninja Techniques Being shrouded in a mysterious cloak of darkness as I lie in wait for my foes can be a lonely and uninspiring process and experience has taught me that it's always best to bring a book. While I do enjoy a good Dan Brown novel and can speak nothing but praise for the latest Anne McCaffrey, it is nice, every once in a while, to read on topics much closer to home. On the long and arduous march toward infinite karmic justice, escapism like this can play an important role; but there's only so much time one can spend reading about dragons and ancient codes before a yearning sets in for something more life-like and real. When I came across this book, my sword of ultimate unity glowed red hot with the spirits of my ancestors and I knew at once that not to purchase it would mean my exclusion from the afterlife and the wrath of my forebears.